Right, finished? Good. That article made realise that, in a nutshell, some cultures talk about saving money in a completely different way than our own because their language is constructed in a different way. Instead of saying, “I’m going to save”, they say instead, “I’m a saver”, or even more simply, “I save”. So instead of the concept of saving money being abstracted by the passage of time, they instead say, in no uncertain terms, that they are savers. There’s no waiting around for the time to be right to become a saver: they are one right now. It’s beautiful. Simple. It goes right into your brain, and it helps you think about the decisions that you’re making. For example when you’re in the supermarket and you’re arguing with yourself, “should I buy the steak, or the discount chicken?”. You probably have the money to buy either one, or even both, but if you’ve decided to be the person who really saves, then you only have one real choice. And once you accept that choice, the philosophy becomes the primary way in which you look at the world. And this philosophy, this take on life, occurred to me again just today when I saw a picture of a bunch of things that don’t degrade. They don’t break down, they don’t rot: they’re doomed to spend the next few millennia floating around our ecosystem. And some of these items are used so absurdly temporarily, considering how long their total existence will be, that it really got me thinking. Take a plastic spoon for example. 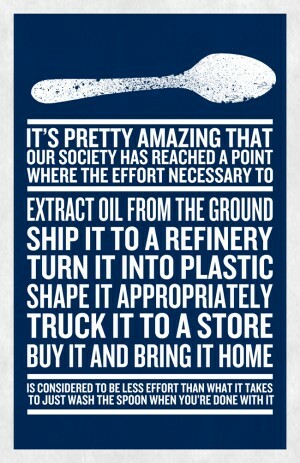 I saw a meme once which said something along the lines of: you can’t be bothered to wash up a few metal spoons, so instead you’ll pay for someone to pull some oil out of the ground, ship it to a refinery, manufacture it into plastic, shape that plastic into a spoon shape, package it, ship it to a store where you can buy it, take it home, use it for ten minutes and then throw it out where it’ll spend the next several hundred years as a useless piece of rubbish. All because you couldn’t be bothered washing up one evening. Isn’t that terrible? So now the guilt I feel from seeing that meme means that I have a packet of plastic spoons in my cupboard which will never get used until I can find a way to recycle them. So let’s get back to the original premise: what’s wrong with our language? How is this meme related to the concept of “I’m going to save”, versus “I am a saver”? First of all let me say that I’m not knocking anybody in the following few passages, I know some bloody great people who talk this way. I’m just wondering if there isn’t a better way to use our language in relation to environmental issues. Your average person talks about handing the earth over to our children, to our grandchildren. What are they going to inherit? What are we going to leave them? Well, what are they going to inherit? And most importantly when are the going to inherit it? That’s the question that springs to my mind. If they’re already here, they’re already existing on this planet, then they’re already partially responsible for its health. Everybody here has some responsibility, don’t they? We have to make a decision about whether we’re going to have plastic spoons or metal spoons. We have to make a decision not just about what we’re going to give to our kids, but what we’re going to teach our kids. Do we say plastic spoons are a bad idea? Well if you say, “I save”, as in, I want to save the world, then that makes the decision for you. If you’re standing in the store looking at the plastic spoons thinking about little Johnny’s party and thinking, “can I really be bothered to wash up 50 metal spoons? Do I even have 50 spoons?” you might be sorely tempted just to buy a packet of plastic ones and be done with it. Yeah, but. 1000 years of those 50 spoons floating around the ocean, versus you going round to a couple of neighbours and asking to borrow 20 spoons each and doing a bit of washing up. Think about it. If you say, “I save”, then you don’t really have a choice. Just like with the discount chicken, the decision has already been made. What do you think? Are you going to change your approach to being eco-friendly? Are you going to “Save” in the present or keep putting it off? Just after I published this I found the meme mentioned above. It’s actually a poster by Max Temkin.